In conjunction with Faster Kittykill! Blog! Blog! 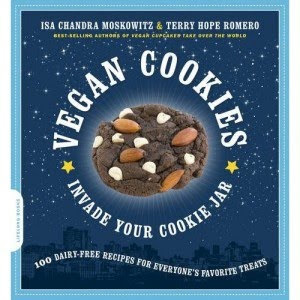 I announce this super easy contest to win a brand new copy of Vegan Cookies Invade Your Cookie Jar: 100 Dairy-Free Recipes for Everyone's Favorite Treats by Isa Chandra Moskowitz and Terry Hope Romero. For your chance to win this awesome book please answer this question: What is your favorite cookie? Contest is open to everyone, one winner will be picked and I will ship out your book after contacting you for your details. Contest ends August 15, 2010. Good luck! I want this book! My favorite cookie is Cowboy Cookies, and my friend made me the Cowboy Cookies out of this book and they were the best I've ever had! I really need this book. I just read your guest blog post, and it was great! Go you! I hate raisins in almost everything, but my very favorite cookies are oatmeal raisin! Go figure. My favorite cookie is definitely chocolate chip. Call me boring, but I could eat bucket loads of those cookies. While chocolate chips are my all time favorite and I would eat them 24/7 if allowed, my second fave is shortbread, yet I've never made them myself. I heard this book has a vegan shortbread cookie that's out of this world. 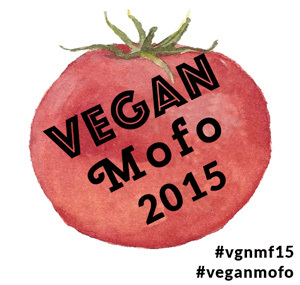 It sure would be nice to be able to use this book for this year's VeganMoFo. chocolate chip cookies fresh out of the oven are yum yum yummy! That was a very heartening post on the fasterkittykill blog from you! I'm glad you discovered vegan food or else i would never have tried your delicious vegan goodies :D I can't wait to buy some brownies from you this coming weekend!!! My favorite cookies are the ones that I am eating at that moment- I am queen sweet tooth and I am crazy about all of them. I have been particularly fond of harder biscotti type cookies with anise and other spices in them. Peanut butter with a chocolate kiss in the middle will be devoured upon sight. A pistachio macaron would be heaven right now. Ok I have to stop. My boyfriend, who I cook for daily, is lactose intolerant so I am definitely going to try out some of your recipes for him. My favorite cookie is a cowboy/cowgirl cookie, with lots of extra cinnamon. My favorite would have to be chocolate chocolate chip, although I like just about any cookie! oooh oatmeal raisin or snickerdoodles or gingerbread scotchies. oh man, do i love cookies. sugar cookies...I just love them! =) So simple and yummy! Sadly, my favourite cookie at the moment is prepackaged. It is the Shopper's Drug Mart organic maple cream cookies. They are friggin' delicious in a sugar coma kind of way.